This looks beautiful and perfect for fall! Love the champagne vinegar in this!! What a beautiful dish visually also! 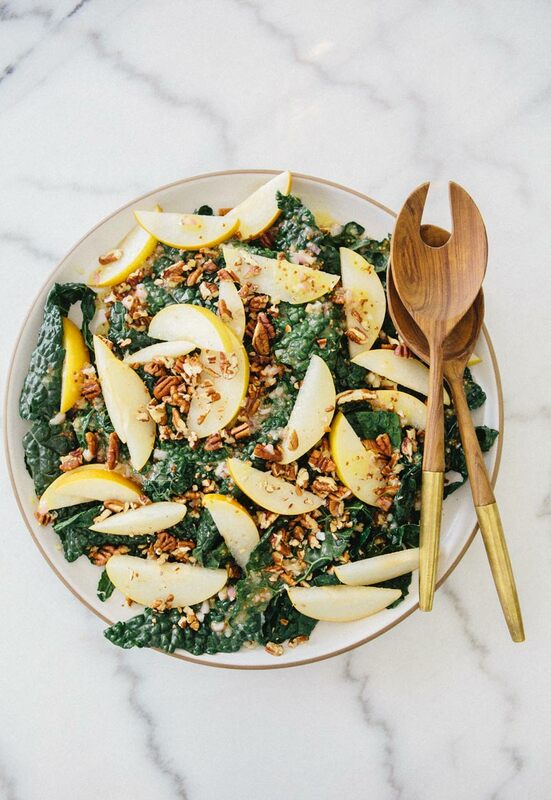 Will keep my eye open for pears the next run to the grocery – I’m always looking for ways to switch up my kale salad. Had roasted beets today that would have been delish with this dressing! This sounds lovely! I’ve been looking for new salad recipes, and I for some reason never think of adding fruit. Will have to give it a try! I love everything about this post! Can’t wait to try this recipe! aahh perfect end of summer meal!!! 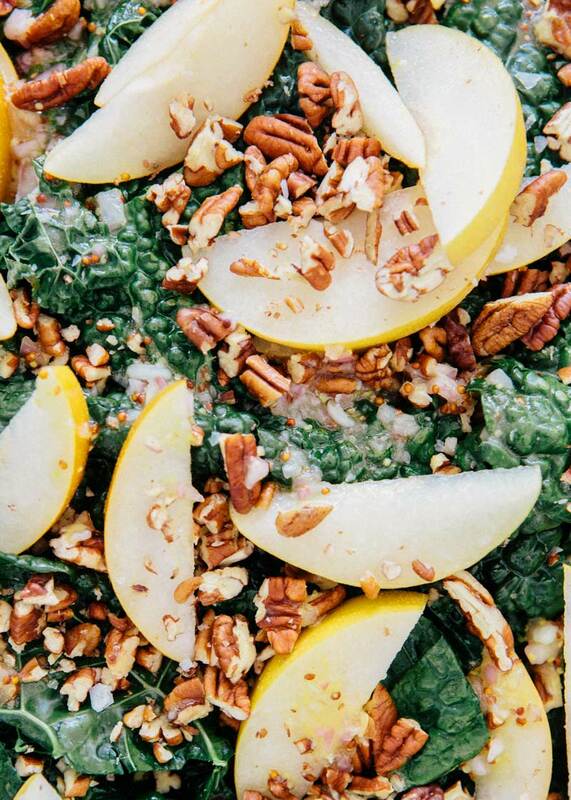 and can be chopped in the food processor for the little miss who loves kale and pears! Looks amazing! I’m used to making warm salads by heating the dressing, not sauteing the greens. Love that only the greens are cooked here, keeping the freshness of the dressing intact. I love this idea and know it will be a hit in my house because my husband is crazy about Asian pears. 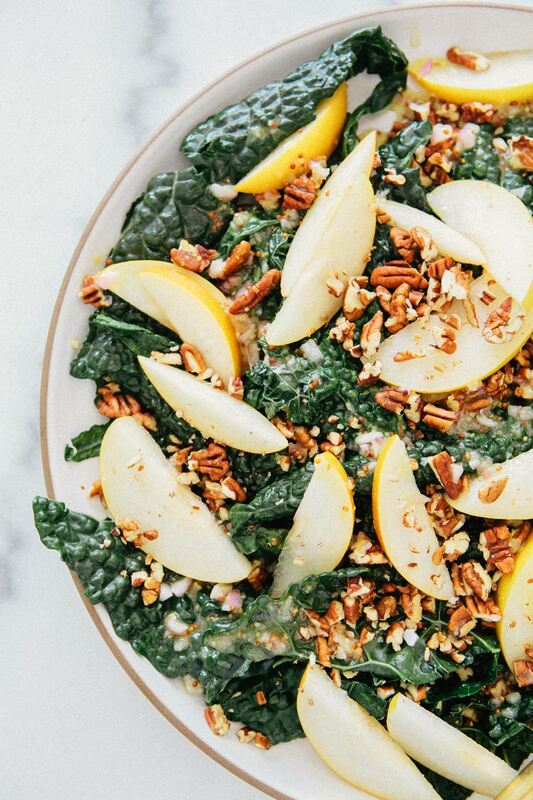 I hadn’t thought of a warm kale salad before. Thanks! Loving the looks of this salad lady! I have a big bottle of champagne vinegar that needs to be used so this dressing is happening. What do you call asian pears? Are they the same as nashi? 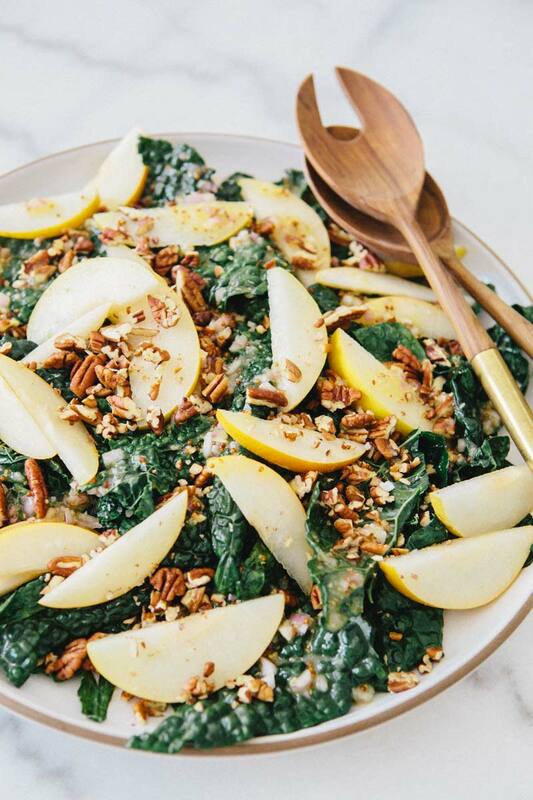 Anyway, this salad looks amazing and I’m going to try it, asian pears or not! I’ll probably use Williams that are my favourite kind! Such a gorgeous healthy salad!! This looks wonderful and perfect for fall! Delicious salad! However, a more organized recipe (ingredients in the order you use them, telling us what to do with the shallot, how long to cook the kale) would have been helpful. This is what I should be making the next time I buy kale! This looks so good!! Great recipe! I do agree with a previous comment though, the directions should have been a little more descriptive. I love seeing food pictures on recipes but it shouldn’t be the bulk of the post. I used a little less mustard in my batch and less olive oil, and just sliced the shallot thin when I added it in the dressing. It was delicious! 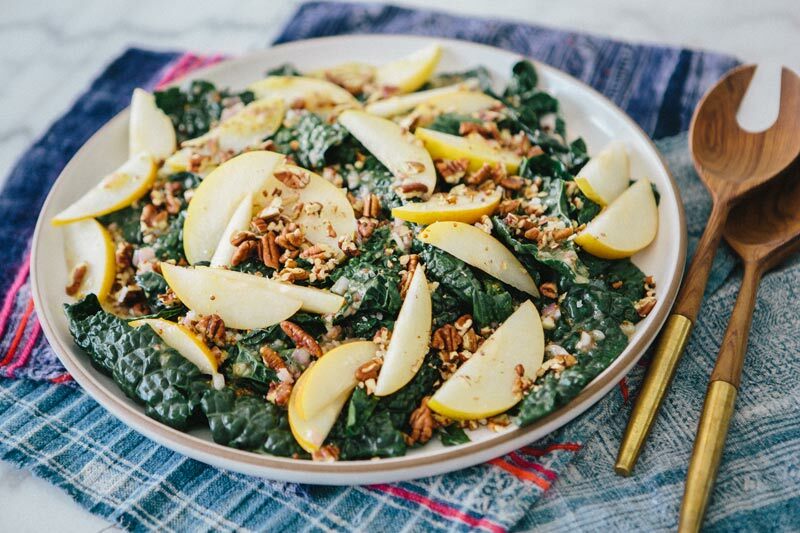 I grew up eating Asian pears all the time. . they don’t get enough love so I LOVE the fact that you used them in this amazing salad! so beautiful!! What a beautiful salad! 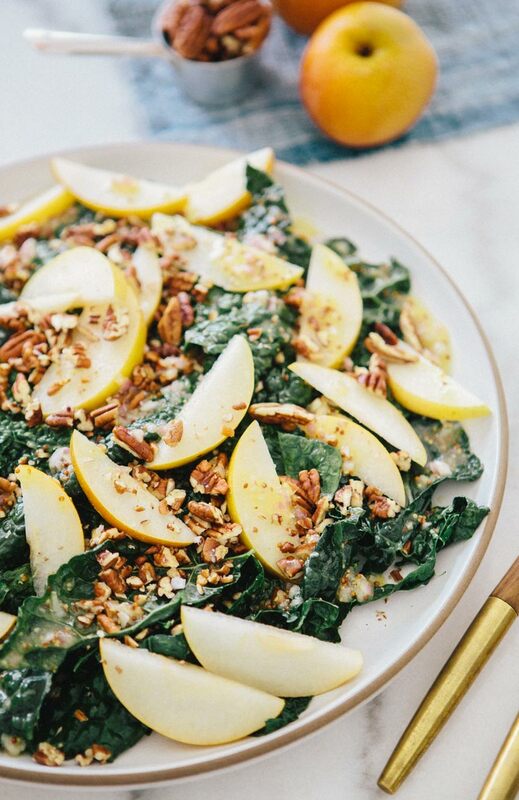 Gotta buy some Champagne vinegar, cause this needs to happen asap (well, as soon as pears are in season again). Thanks for the inspiration, Sarah! I loved this salad! Reminded me of a restaurant salad. Next time I wont wilt my kale as much but I still loved it.